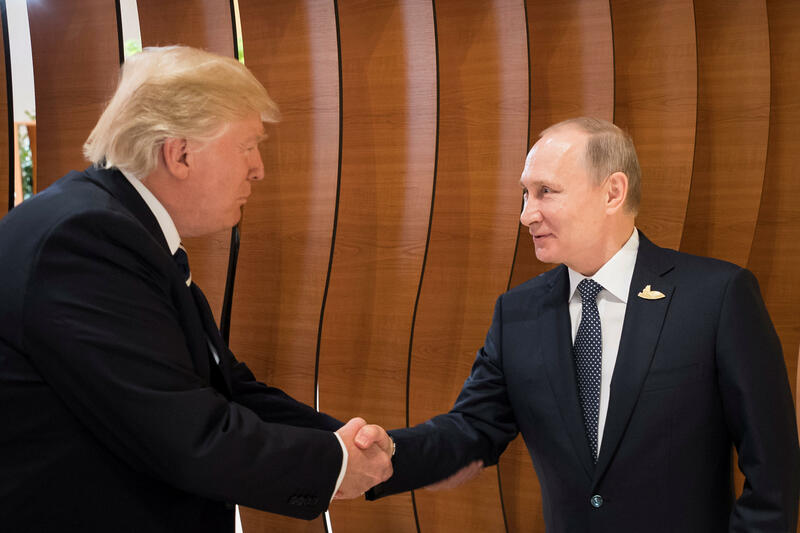 President Trump and Russian President Vladimir Putin had a previously undisclosed conversation over dinner at the G-20 summit in Hamburg, Germany, earlier this month, the White House confirmed on Tuesday. The White House is refusing to characterize their discussion as a meeting, with press secretary Sean Spicer simply saying the two world leaders "spoke" during the dinner with other world leaders. The White House is calling the suggestion that administration officials tried to hide the discussion "false, malicious and absurd." The conversation took place near the end of the dinner. Mr. Trump tweeted on Tuesday night that reports of a "secret dinner" were "fake news." Mr. Trump spoke to Putin through a Russian translator, since the American translator did not speak Russian, the White House said. "There wasn't a second meeting," Spicer said in a gaggle with reporters Tuesday evening. "I don't know the exact timeline but I know it was during the dinner. They spoke." The development comes amid the continued focus on a June 2016 meeting between Donald Trump Jr., Jared Kushner ex-campaign chairman Paul Manafort and several Russians. The number of attendees at the meeting continues to grow, as the White House attempts to defend the eldest son's decision to meet with a Russian lawyer who said she had information supposedly from the Russian government that would incriminate Hillary Clinton. CBS News reported on Tuesday that Ike Kaveladze, a Soviet-born businessman who came to the U.S. in 1991, also attended the meeting. Mr. Trump's first official meeting with Putin at the G-20 lasted more than two hours, and although Mr. Trump and Secretary of State Rex Tillerson have shared their accounts with what happened at that meeting, points of their accounts seem to contradict the Russians' description of it. In other Russia-related news, Mr. Trump on Tuesday night officially announced his intention to nominate Jon Huntsman, former Utah governor and former U.S. Ambassador to China, to be U.S. Ambassador to the Kremlin.